Sometimes more than one article gets published almost simultaneously on the same topic, sometimes with similar methodology. Two systematic reviews of the effects of trying to avoid or curtail endotracheal intubation in order to protect the lungs have just been published. One of the reviews (Schmolzer GM, Kumar M, Pichler G, Aziz K, O’Reilly M, Cheung PY: Non-invasive versus invasive respiratory support in preterm infants at birth: systematic review and meta-analysis. BMJ 2013, 347:f5980) only included studies that intervened in the delivery room. They found 4 studies (COIN, SUPPORT, CURPAP, VONDR). All of the studies compared immediate intubation for surfactant to CPAP, one gave the surfactant using a brief intubation (the INSURE technique), one had 3 groups, CPAP vs intubation and conventional weaning vs INSURE. The other 2 studies compared CPAP to intubation with either selective or routine surfactant. They found a 9% reduction in the combined outcome of death or BPD in the groups that had an attempt to maintain on CPAP, rather than being intubated, the NNT was 25. The other publication (Fischer HS, Bührer C: Avoiding Endotracheal Ventilation to Prevent Bronchopulmonary Dysplasia: A Meta-analysis. Pediatrics 2013) included 3 other trials, which are somewhat different, the Columbian Neonatal Research Network trial, which excluded infants under 27 weeks, and randomized babies to either CPAP or INSURE within 60 minutes of birth, and 2 trials which are somewhat different. Gopel et al compared CPAP to CPAP with minimally invasive surfactant treatment (I will call it MIST after Peter Dargaville) but in fact they also included infants who were already intubated, so it is not so comparable to the other trials. 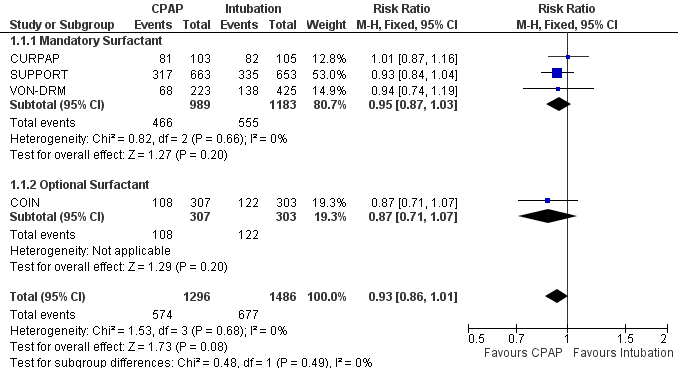 Kanmaz et al compared CPAP with MIST to INSURE. The systematic review concluded that there was a 17% reduction in the combined outcome of death or BPD, with an NNT of 35. There will very shortly appear in ‘Seminars in Perinatology’ a review article that I was asked to write for an NIH conference in January. I was asked to perform an evidence based review of interventions that improve outcomes in the extremely preterm infant. (It was supposed to appear in October so there are 2 days left!). One of the things I did in that review was to look at the same issue; unfortunately there are very few extremely immature babies in the studies, I included the 4 trials in Schmolzer et al’s review mentioned above, but I separated the analyses into those that compared CPAP to INSURE, and those that compared CPAP to intubation with conventional weaning. 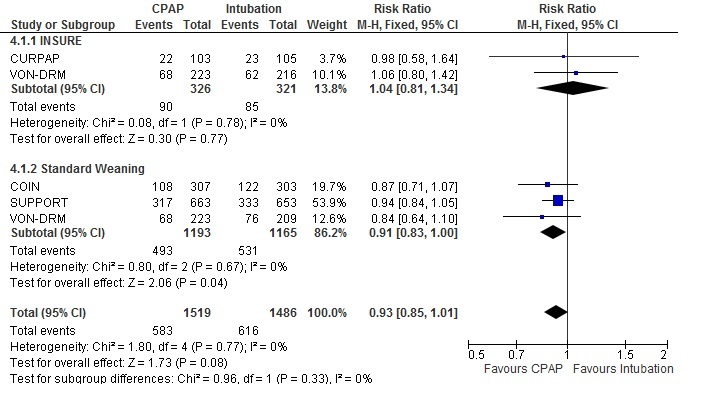 As you can see from this Forest plot, that suggests that there is an advantage of CPAP started in the DR compared to intubation and standard weaning, but if you have to intubate, you should strongly consider the INSURE technique, which may have similar benefits. As you can also see if you are very perceptive, I included the VON-DRM CPAP babies twice, for the subgroup analyses that makes no difference, for the overall analysis, it is such a small number of babies that it makes no real difference to the final result. As you can see the confidence intervals include 1.0, just. When I divide the analyses into those studies that mandated surfactant for all the infants, to those that had optional surfactant therapy (that is the COIN study, where the large majority did get surfactant) the overall result is the same, a very nearly significant reduction, even when including the VON-DRM CPAP babies only once. UPDATE** review article has now been published. Barrington KJ. Management during the first 72h of age of the periviable infant: An evidence-based review. Seminars in Perinatology. 2014;38(1):17-24. If you want a copy and don’t have access, I can probably find you a source! This entry was posted in Neonatal Research and tagged BPD, CPAP, Randomized Controlled Trials, surfactant treatment, Systematic Reviews. Bookmark the permalink. May I request a link to your literature review in seminars that has been mentioned in this article, please?